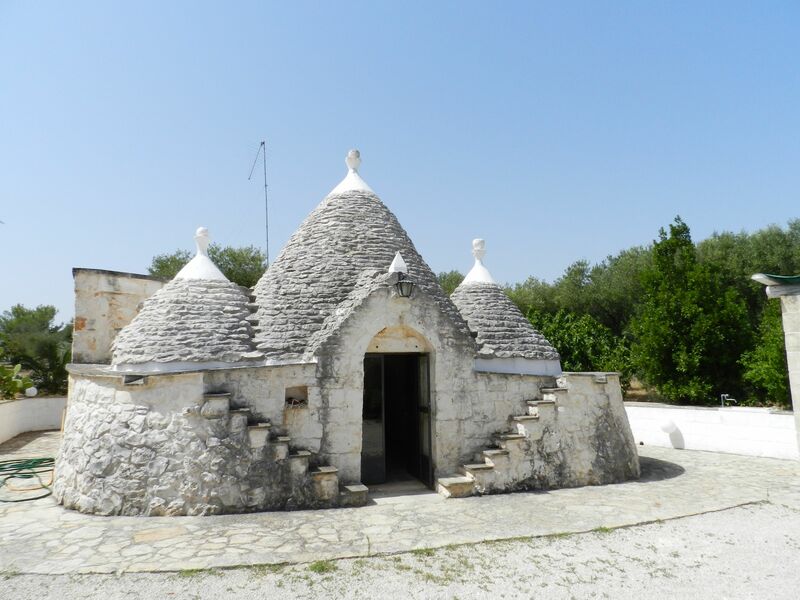 A “trullo” we looked at in Puglia a couple of years ago. For years, Mikel, my husband, and I have considered buying our retirement home somewhere in southern Europe. We’ve looked in Provence (too expensive), Liguria (ditto), and Puglia (too hot and crowded in summer). I speak both French and Italian reasonably well, hence our searches in those countries. We prefer the food in Italy, but France is gay-friendlier, legally speaking, and we’re afraid the Vatican is just too powerful a voice in Italy for things to improve much in our lifetimes. We love Sicily, but getting to and from the island can be challenging; we don’t want to be so far removed from friends and family that our location precludes visits. 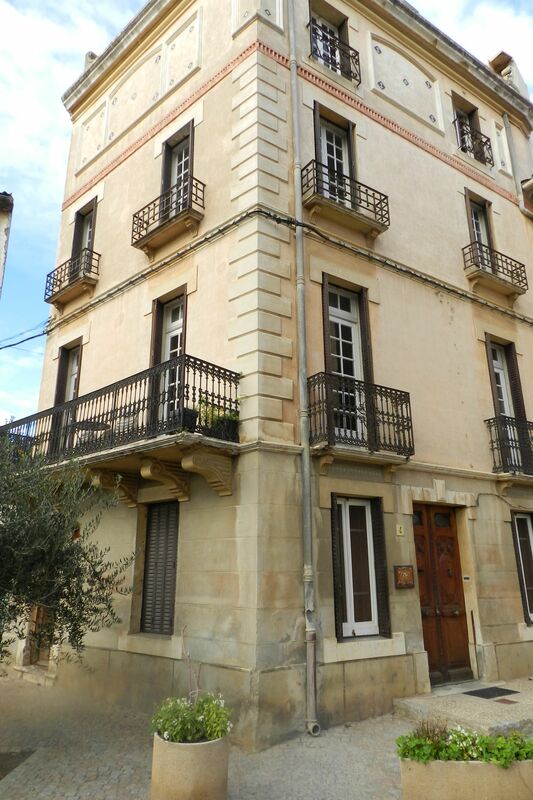 We tried to buy this house in Bize-Minervois several months ago. About a year ago, when I went to join him in China after having knee surgery, we began to think much more seriously about our retirement plans (I’ve recently turned 65). Access to good health care — as well as a warmly temperate climate — has suddenly become a major priority for us. The last time we were in Provence, we noticed that as soon as you cross the Rhône River into the Languedoc, real estate prices are half what they are in Provence proper. 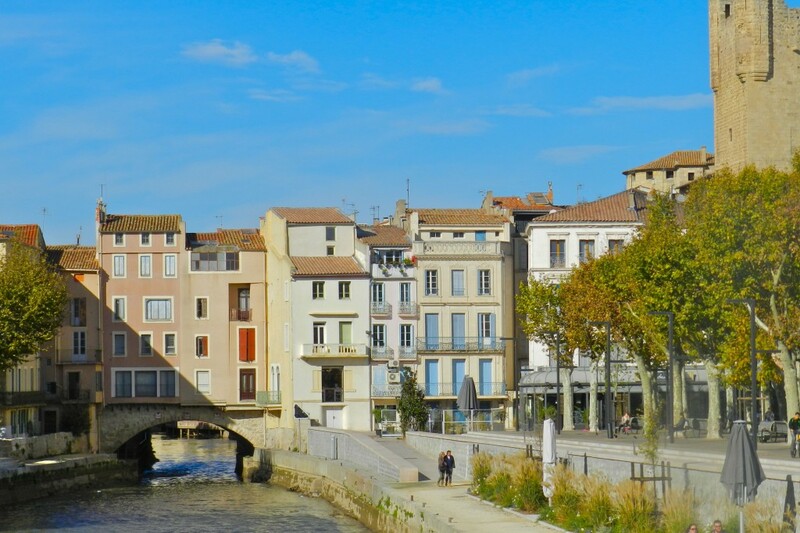 Yes, we love Aix and Arles, but we had never spent any time along the Canal du Midi, we were fascinated by the ancient Cathars, I have a dear friend in Toulouse who has been begging me to come visit, and we love the oysters, wines, cheeses, and produce of the region. Our go-to French bistro in Washington DC when we lived there was Languedocien. So we contacted a handful of realtors, booked our around-the-world flights, with three weeks in France, a week with family in the American South, and a week lounging on a beach before heading back to China. But that was then. I had some medical problems I couldn’t get cared for in China, the pollution was driving me crazy, I wasn’­t particularly fond of the food, and there were some new business opportunities in the lowcountry that I wanted to investigate. So we bought a little house in Savannah, Georgia, where I will live part of the year, and Mikel and I will see each other when we can. We pared down our trip to three weeks in France and two back home. I don’t know that I’ve ever seen a landscape more varied. I’ve certainly never seen so many vineyards before. Neither of us had been to the Languedoc before, though we both love many of the wines from the region. Six years ago I raved on the blog about two wines from Gaillac, where my friend lives northeast of Toulouse, near Albi. I have been tasting and watching the evolution of Languedocien wines for many years now. For over 100 years, Languedoc has been one of the biggest wine producing areas in the world, but much of the wine produced was rough plonk, often shipped to northern France to bolster the spirits of Eastern European mine workers. But as competition from Australia, Chile, and California began to eat into profits, winemakers in the region began pulling up old stock and planting fewer vines per hectare, which results in more refined wines. They analyzed soil samples and brought in scientists and agronomists and vintners from other regions to help them make better wines. The wines have improved by leaps and bounds. 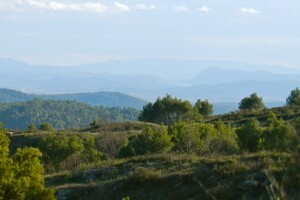 By 2007, Languedoc (formerly Côtes du Languedoc) had become its own appellation, encompassing reds, whites, and rosés in a variety of styles. Sweet and sparkling wines, as well as some other specialized appellations that had already been awarded the mark of distinction, are classed differently. 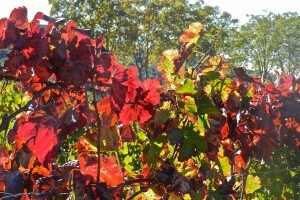 Three fourths of the wines are red; fully a third of the vines in France are in the region. Seven different grapes are used in Saint Chinian. 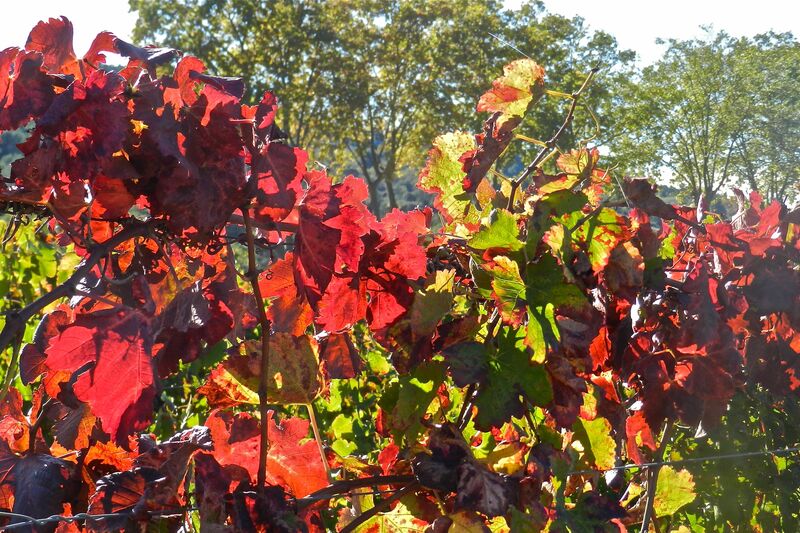 The vineyards after harvest in the fall are blocky patchworks of reds, yellows, greens, and browns, because each grape variety’s leaves turn at a different time. Some of the wines have long been good, but they never had much international distribution until 10 or 15 years ago. Mikel and I immediately took to the Cahors, Corbières, Minervois, Faugères, and Saint-Chinian that we discovered here and there in the States. We were excited to go to the source. Most of the wines are delightfully quaffable, medium-bodied wines with forward fruit. Grenache, Syrah, and Mourvedre predominate the reds, much the same as in the neighboring Rhône Valley. (To a lesser and lesser extent, Carignan and Cinsaut are included.) 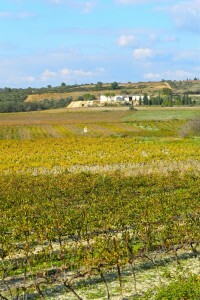 The whites, too, are sometimes based on similar varieties as the white Rhônes (Viognier, Marsanne, and Roussane), but more often the local varieties Grenache Blanc, Clairette, and Bourboulenc are used. Along the coast, separated from the Mediterranean by a spit of land that limns the Bassin de Thau, where oysters are grown, a citrusy white made from the local Picpoul grape is served with the myriad seafood dishes. At a waterfront eatery in Mèze, we enjoyed a local Picpoul de Pinet as we gorged on plump oysters and a platter that included buzots and moules and calamar beignets and shellfish couscous and calamar à la sétoise and ratatouille and shrimp and lots of aioli and rouille. I had never before been a fan of Picpoul, but eating shellfish there a few steps away from the vineyards… well, it was just perfect… and the crisp Beau Vignac we drank had just won the Gold Medal at the wine expo in Paris …. Of course we often began our meals with the sparkling wines of the region, which we have drunk occasionally for 20 years. The bone-dry Blanquette de Limoux, which can taste like honeydew melon sprinkled with lime juice, is from St. Hilaire, just south of Carcassonne. Its bright yellowish-orange label has been brightening shelves in the States for years. Crémant de Limoux (also just south of Carcassonne) is made from the local Mauzac grape (at least 90%), which can make the sparkler taste of apple cider, but we fell in love with the rosé version, which has more of a bright berry aroma and flavor. 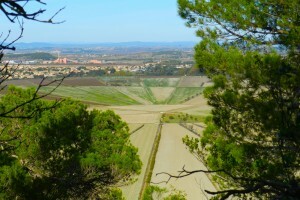 It was easy to see as we drove through the countryside why Languedocien wines vary so much: the landscape is widely diversified, with verdant mountains, shale canyons, limestone cliffs, chalky river beds, and alluvial coastal plains. The Domaine des Terrisses Cuvée Saint-Laurent by Cazottes et Fils is an AOC Mousseux Gaillacoise (traditional sparkling wine from Gaillac) that employs the “Methode Gaillacoise,” which is the “rural method” also used in Limoux. The fermentation is stopped by a series of rackings and the wine is bottled before all of the sugar is converted into alcohol. The wine tastes of peaches and roses. The Cazottes have been winemakers for seven generations, and they, too, grow their mostly indigenous grapes on chalky soil. Mauzac and Len de L’Elh are the traditional varieties used in and around Gaillac. Even with the increased summer temperatures that climate change has effected, most of the sparklers include less than 12% alcohol. “Les Rials” is the name of another amazing little wine from Gaillac, an inexpensive , fresh white wine for summer made from the Loin de l’Oeil (Len de l’Elh in dialect) grape, which is only grown in the region. Little is known about the grape, which ripens a full two weeks earlier than other grapes. The grapes are prone to rot on the vine, but often the benevolent form of the fungus Botrytis (that lends a sweetness to some of the world’s best dessert wines) is the end result. Les Rials is 100% Loin de l’Oeil (“far from the eye” or “out of sight”), said by some to refer to the relatively long distance of the grape bunch from the branch. The local AOC for this wine is Fraîcheur Perlée, which does not mean the “pearl of freshness,” as some sources say, but is more at “perfectly fresh” in the sense of newness, purity, and refreshment. This slightly dry wine has a floral nose with a hint of citrus, and a delicate flavor of greengage plums and apricots. A pleasant 12% alcohol, the wine is able to carry the fruit flavor because it’s barrel-fermented and kept sur lie for a while. It is available in the States and sells for about $12. I have known Margherita Orsino since we met in Genoa, Italy, her hometown, in 1982. A professor of Italian at the University of Toulouse, she is a stark-raving intellectual who knows how to have a good time. Passionate about her work (she often translates French poetry into Italian, and vice versa), she has an artist’s eye for detail and nuance, a great love of life, and a marvelous sense of humor. Like Mikel and me, she prefers small family-owned bistros and trattorias to restaurants. ; she would rather eat at home. 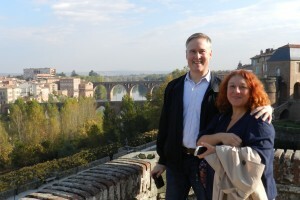 Her partner, Christophe, is from much deeper southwestern France, near the Pyrenees. He works for the local vignerons along the Tarn between Gaillac and Albi. The Gaillac AOC is home to the oldest winery in France. Several of the wines he brought home were distinctively of the place. 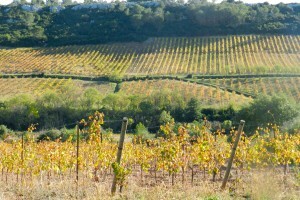 It is said that no other wine growing region in the world has the distinction and diversity of Gaillac. 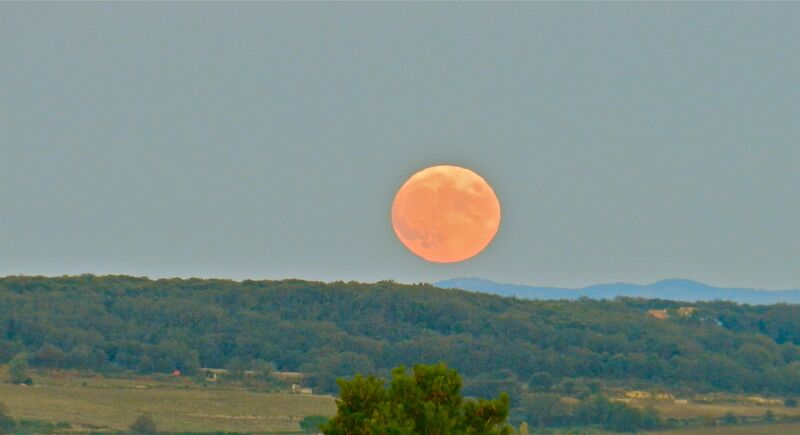 The Mauzac and Loin de l’Oeil, mentioned above, are the local white grapes, which are grown nowhere else except in this very localized area around Toulouse. I had never heard of any of the grape varieties that Christophe served us — the Prunelard, the Duras, and the Braucol. The Prunelard is very similar to Malbec, the wine grape of Cahors, but it is grown by very few farmers. The Duras and Braucol are grown nowhere outside the region. The Duras was my favorite, a deep red, spicy, elegant wine with a somewhat floral bouquet. The Braucol is closely related to, and tastes like, Cabernet Sauvignon. Larger producers in the area are growing Syrah and Merlot (and we saw trucks with Bordeaux license plates on them, down in the Languedoc to collect Merlot grown there! ), but the smaller producers are sticking to the traditional, local varieties. The only wine I didn’t care for was the organic Bordeaux-style blend; neither did Marghe. 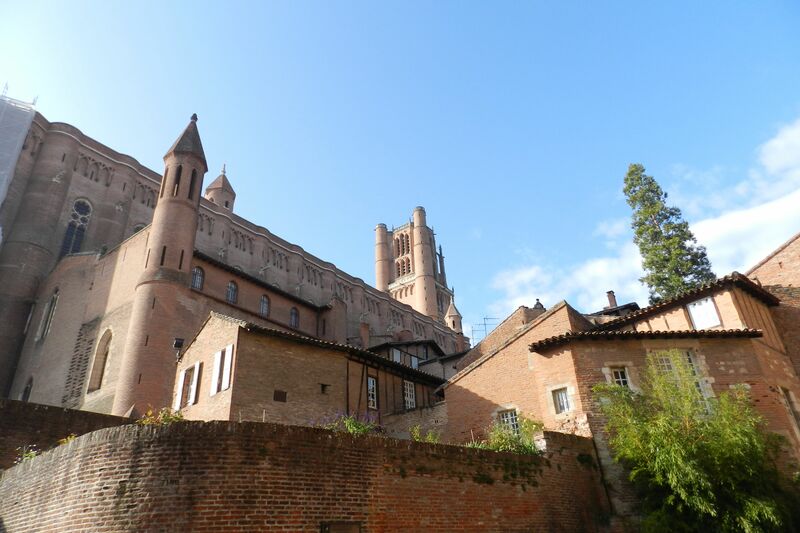 We spent a day touring Albi, the famous center of the Albigensian Crusade against the Cathars, where the mighty 13th Century cathedral and bishop’s palace made of red brick rises up dramatically above the Tarn with a decidedly modern feeling about it. It must have been something to behold when it was built. I’ve always thought that Catholicism used smoke and mirrors and great works of art to seduce the peasants into believing, but I’ve more than often wondered what even greater works of art would have been made if the artists’ patrons had been merely art lovers. Mikel and I left Marghe and Christophe to spend a week in each of three towns – Roujan, a small village near Béziers, close to the coast; Bize-Minervois, an even smaller village where we had seen the house (pictured above) that intrigued us; and Carcassonne, the great fortressed city that conjures knights and musketeers. We met them later in Montolieu, the “Village of Books,” a medieval town of less than 1000 people at the foot of the Black Mountains, where 15 booksellers and a print museum attract thousands of visitors each year. We had a perfectly lovely lunch at Les Anges au Plafond (Angels in the Ceiling), run by an Englishwoman and her French husband. Because we were visiting in November, however, we never saw any crowds, and, in fact, many places were closed, regardless of the hours they advertised. 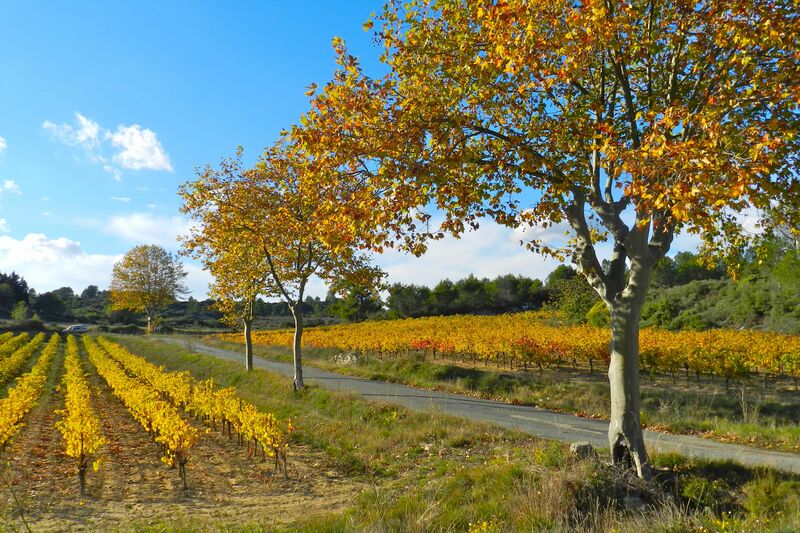 November is a lovely time to visit the Languedoc. There’s ample sunshine and the food and wine are superb, but many museums, shops, restaurants, and wineries are simply closed for the winter season. There seems to be no rhyme or reason to the closing times. We couldn’t even climb up to visit the famous Cathar ruins in Lastours because the entrance to the trails was through the closed museum. 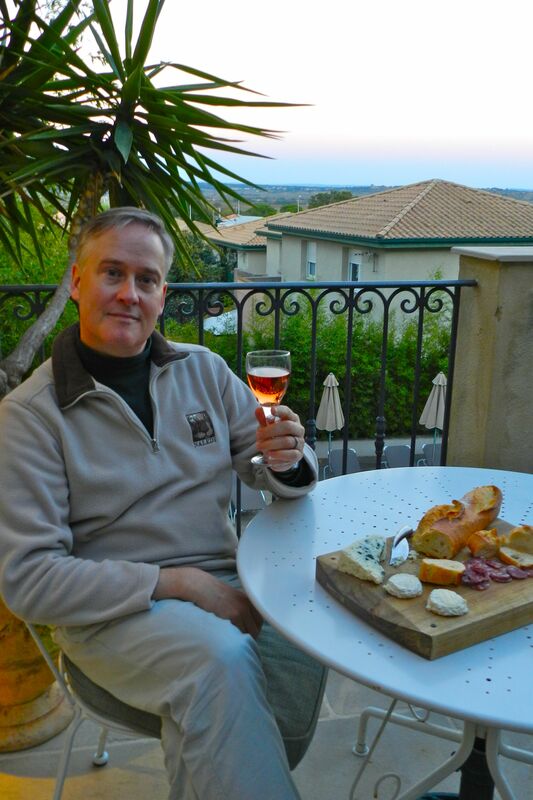 Mikel on the balcony of our suite in Roujan at sunset with our typical evening meal of Roquefort, Pelardons de Cévennes, local bread, local sausage, and local rosé. Not that it mattered. We weren’t in France to tour any more than we were there to buy a house. We were just being together and relaxing. Our usual m.o. when we travel is to rent a place with a kitchen, travel and/or tour during the day, when we have our big meal, pick up some salad fixin’s and cheese and bread and charcuterie from the local markets, and eat lightly at night over a bottle of wine. On this trip, we rarely planned our days and often we simply stayed in our neighborhood. Bérangère sorting through the keys to the properties she represents. 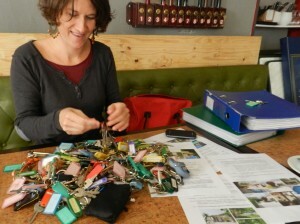 We did keep one of our appointments with a realtor, the delightful Bérangère Guyen of Freddy Rueda Sarl in Saint-Geniès-de-Fontédit. 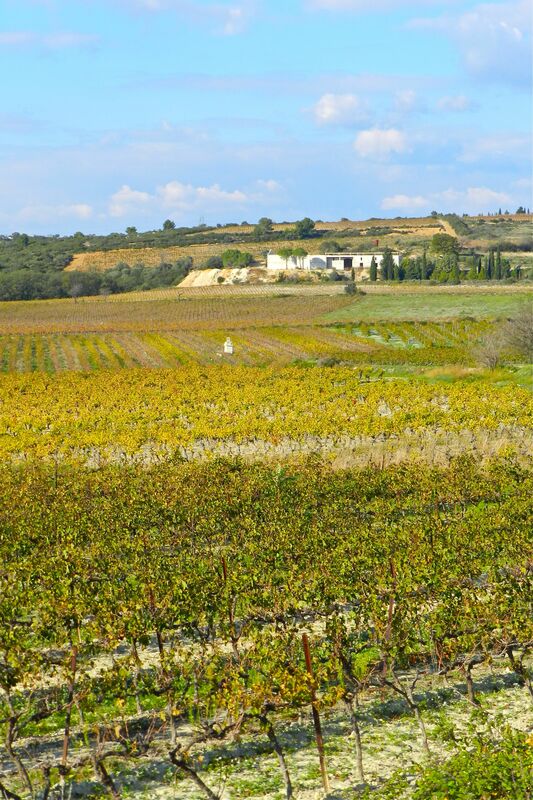 We looked at several houses in the region north of Béziers, including Faugères, the Côtes de Thongue, and les coteaux du Languedoc-Pézenas, whose wines I know and like. 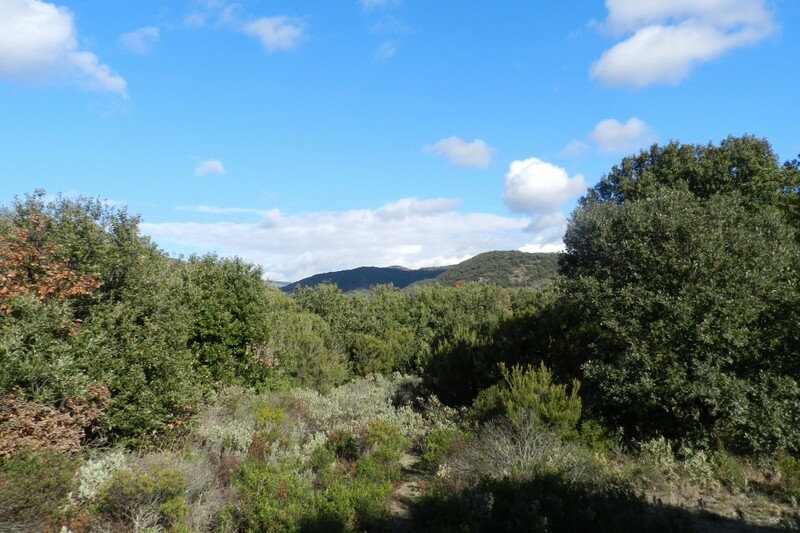 Everywhere we went, the garrigue perfumed the air that also hinted of the nearby sea. I would get out of the car to take photos and my pants legs rubbing up against the brush would fill the car with an herbal scent for a half hour or so. Most of our days were sunny and we usually drove with the windows open. 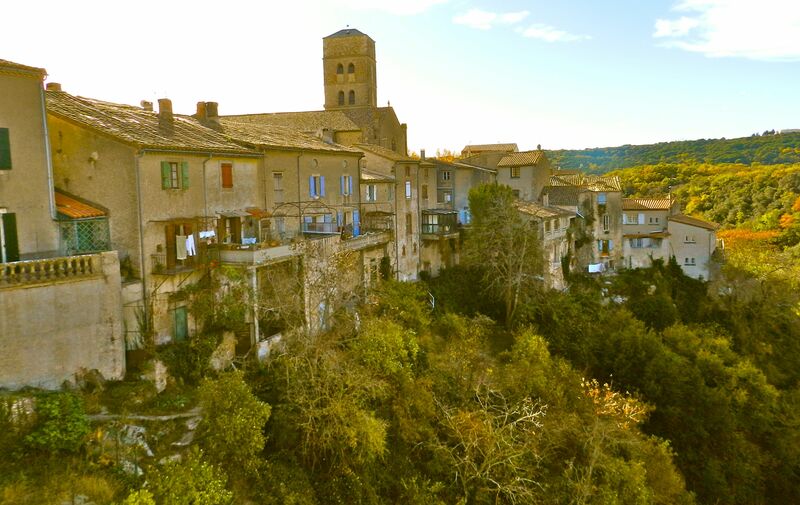 Bérangère suggested we drive up to the Barrage des Olivettes (the Olive Grove Dam) and perhaps dine in the old rectory atop the hillside village of Vailhan, but we had eaten in Faugères and wanted to get back to our lovely guest house in Roujan, where we were the only guests. The owners, Greg Taylor and Alex Charles, had us up to their flat for drinks and hors d’oeuvre. They also run the informative Crème de Languedoc site. 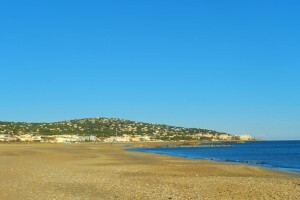 Roujan doesn’t have much to offer but it is very conveniently located to the coast, the Black Mountains, miles and miles of vineyards, and the cities of Montpellier, Béziers, Sète, and Narbonne. 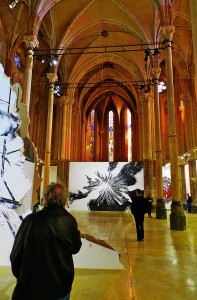 Mikel fell in love with Narbonne; I, with Sète. 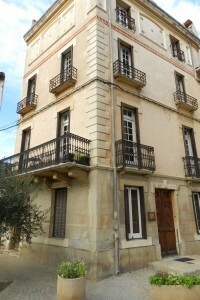 Montpellier is bigger, with 80,000 students. 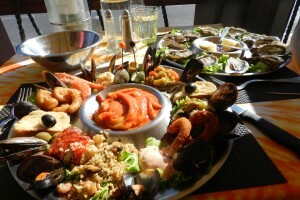 It is said to be the “second gay city of France,” We had lovely days in all of them and we ate very well, with fresh local oysters at nearly every meal. We nearly always drank the house wines and were never disappointed. 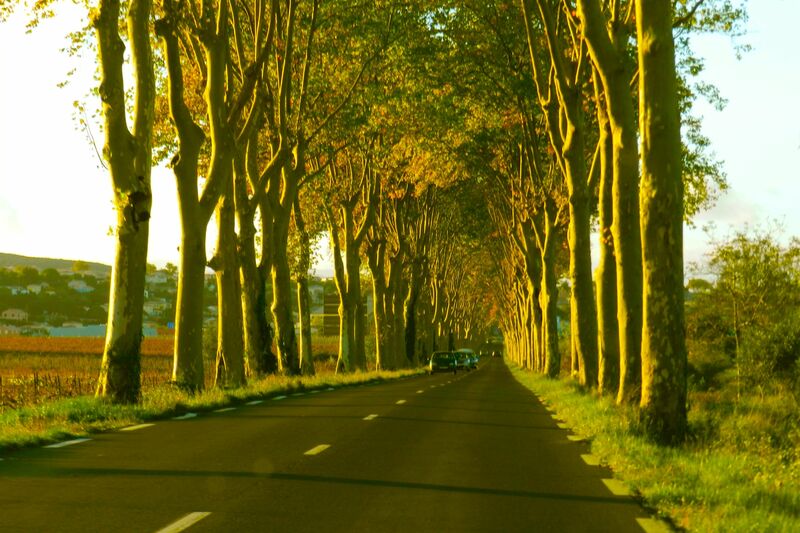 Everywhere we drove, the roads were lined with majestic plane trees, but later in the trip we learned that the 42,000 trees that line the Canal du Midi are threatened by a canker stain that could kill every one of them within 20 years. 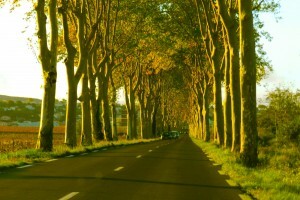 See www.replantonslecanaldumidi.fr if you would like to help replant the trees. I don’t mean to belittle Roujan; it’s delightful, with two bakers in town, a decent butcher who also roasts chickens and prepares traditional dishes such as confit and cassoulet, and several decent restaurants. There’s a big supermarket and pharmacy on the outskirts of the village, Béziers is only a few miles down the road, and Alex and Charles provide their own guide book with information on just about anything you could possibly imagine. They offer coolers and picnic baskets and bikes as well. It’s a predominantly gay guest house in the summer, but it was off-season and not only were we the only guests, but we got to meet their parents, who also live in the area. Greg’s mother, it turns out, is closely related to the Hartridges of Savannah! We tried to get home every night for the dramatic sunsets and moonrises. This was the view from our suite at Cinq et Sept. Some days we could see the Mediterranean in the distance. Mikel and I both have always been suckers for the coast. We have spent most of our holidays over the past two decades on beaches, from Florida to Thailand. 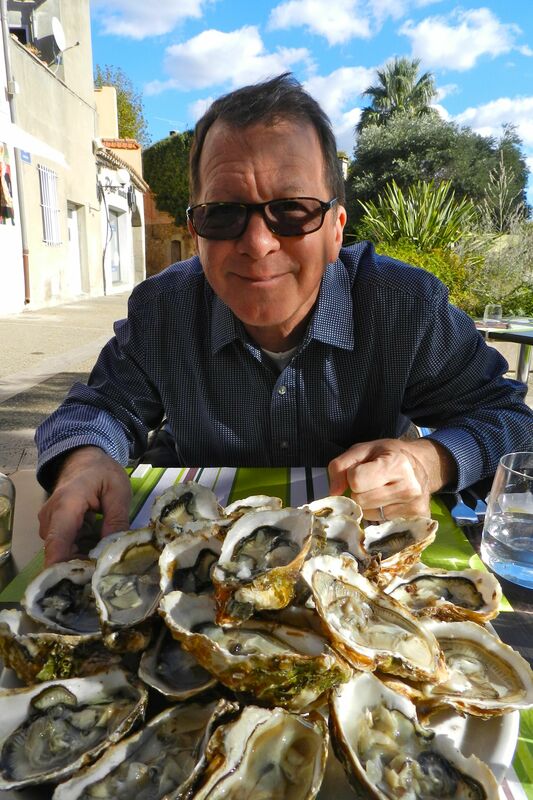 We’re both inordinately fond of oysters, and we had become quite smitten with the large, salty, meaty, juicy oysters from Sète the last time we were in southern France. It’s no wonder, then, that we had oysters in Béziers, Narbonne, Mèze, Montpellier, and Pézenas, as well as in the Aude (southwest of the Hérault) in Lézignan-Corbières and even as far inland as Carcassonne. I am now the exclusive American distributor of this excellent tool. The oysters grown here are the Pacific oysters (Ostrea gigas), entirely different from the belons of Brittany (Ostrea edulis, the European flat oyster) and the Western Atlantic oyster (Ostrea virginica), which is found from Canada to the Gulf of Mexico. 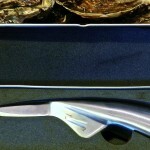 The most highly touted Thau oysters are raised in the oyster “park,” as it’s called, off the coast of Bouzigues, a small fishing village tucked into the northernmost corner of the basin. 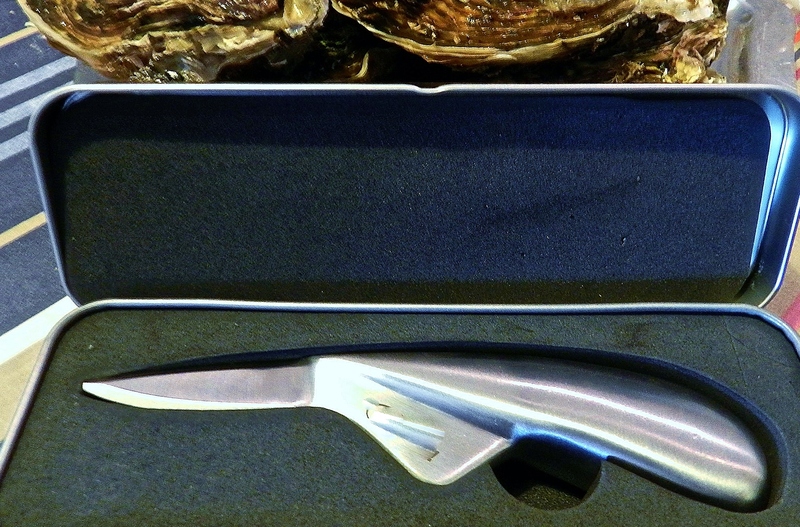 In Carcassonne we bought them at the weekly market, then splurged on an elegant Dutch oyster knife of brushed stainless, possibly the best one I’ve ever used. I am now carrying them on my website. The wonderful shop, Côté Ferme where I found the knives in Carcassonne, is a must should you find yourself there. Narbonne is charming. Following the success of the Canal du Midi, which linked the Mediterranean with the Atlantic, the Canal de la Robine was built in 1686. It meanders through the city center, which is much more sophisticated than its population of 50,000 would have you believe. Major train lines converge at the centrally station, ferrying thousands of tourists and winter visitors who come for the excellent seafood, fruits, and wines. The indoor market is a festive greeting place which reminds me of a smaller version of Barcelona’s La Boqueria. There’s definitely a bit of the Catalan spirit here , and the Spanish culture capital is only a three-hour train ride away. This bridge over the canal in Narbonne has houses built on top. 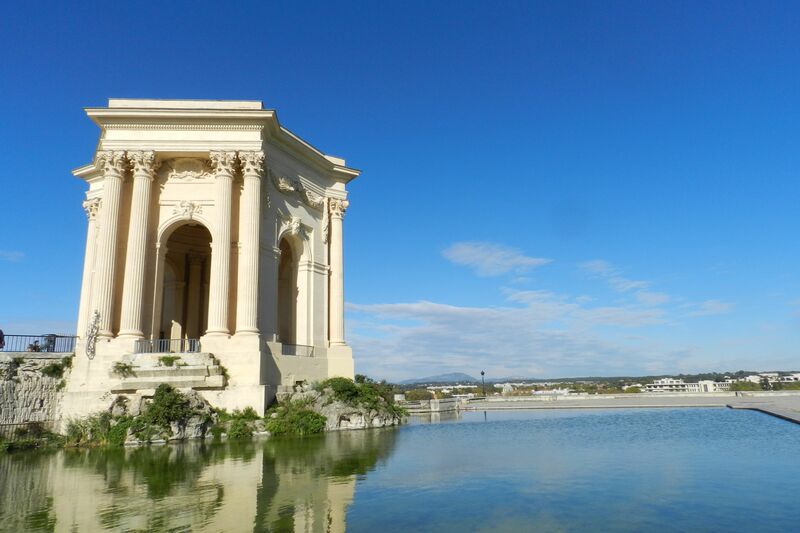 Narbonne was once one of the largest cities in Gaul and one of the most important ports, so much so that it was the first city that the Romans colonized outside Italy proper. The old city center is filled with both church and government buildings as well as Roman ruins. You can eat (mostly standing) in the popular covered market, Les Halles, a Baltard style glass and steel pavilion, or in any number of restaurants lining the canal. 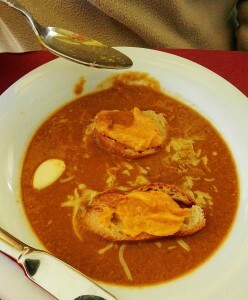 We were thrilled with our lunch at L’Estagnol, where we had more oysters (local) and a delicious soupe de poisson with rouille. They called it neither bouillabaisse nor bourride, but it was just what we wanted for the somewhat chilly, however sunny, day. We drank the local rosé from La Clape, a crispy blend of Mourvèdre, Syrah, and Grenache, with just enough fruit to balance the garlicky stew and just enough acid to brighten it. 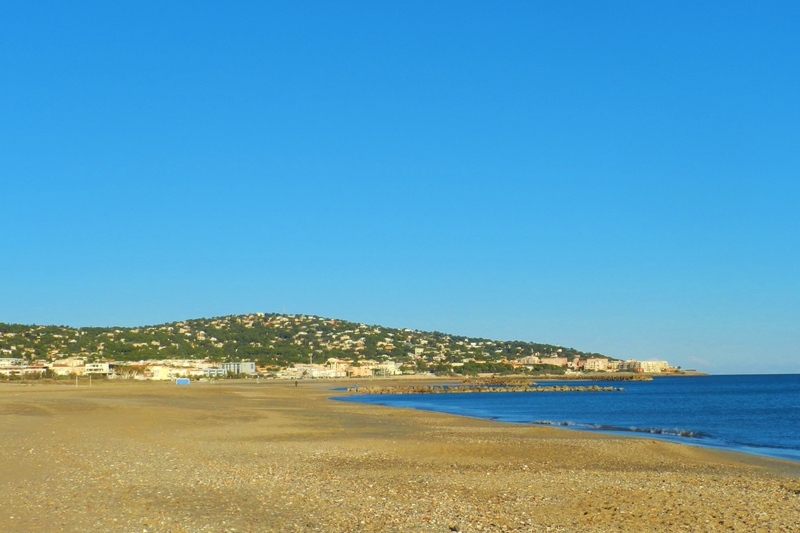 I loved Sète, a mini Marseille, with its boats and Belle Époque buildings and its shops and squares and markets, its North African bakers and couscous sellers, and its fabulous location at the head of the 12-mile-long Corniche beach, topped by Mont-St-Clair. We spent a week near the coast, exploring both the cities and the countryside. If you want to go to the Languedoc and want some action, don’t miss Montpellier. It’s a marvelous city of nearly a half million, nearly a fourth of whom are students. There is grandiose architecture and marvelous public spaces, lots of art galleries and coffee shops and music venues and bookstores. The TGV arrives from Paris every day, and there are a dozen daily trains from Avignon. We walked for two hours looking for a restaurant that had been recommended to us. (The maps are very confusing and the city, though the fastest growing in France, is still not quite set up for tourists.) We’ve read that it’s a gay mecca so to speak, but that’s not really interesting to us, except to know that we are accepted. It’s the only town where I had someone get upset with me: I was taking a photo of some men in a public park. I was several yards away and was not looking through the viewfinder, but he saw the camera pointed his way and he became very vocal, telling me he would “steal” my camera if I were taking his photo. He was an older man, and he and his friends seemed to be North African to me. They were sitting outside a community garden. I usually don’t take photos of folks without asking, but it was the group of men on the bench outside the garden that I wanted. I think he was probably an illegal alien who had been there for years but with the recent backlash against immigrants, he felt threatened. I apologized to him and showed him that there were no images in my camera, but he didn’t want to have anything to do with me. I’m pretty sure I assessed the situation correctly and I don’t blame him. 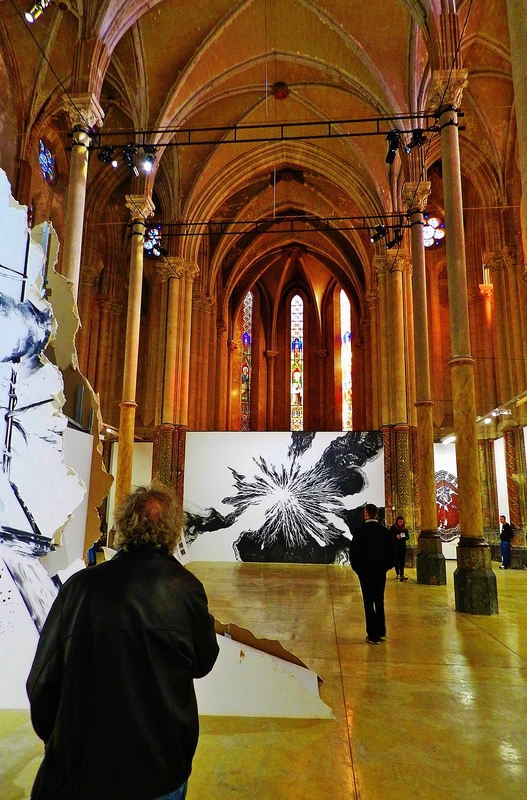 Béziers was more to our liking. One of the oldest cities in France, it is situated on a high bluff overlooking the Orb River and the Canal du Midi. There are Roman ruins, still being excavated, and a lively public square. Most of the old street signs are written in Occitane (the Langue d’Oc) as well as French; it’s closer to Catalan than French. 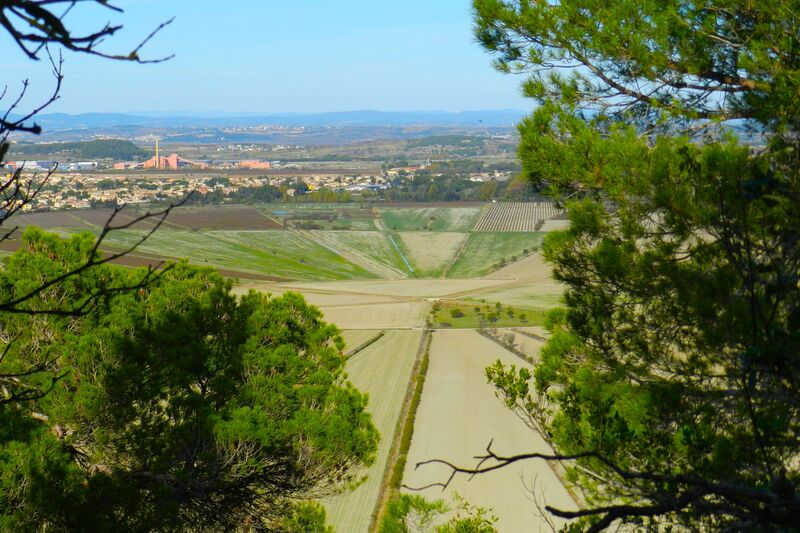 Nearby, the Oppidum d’Ensérune is a pre-Roman site on a hillock overlooking the Montady Swamp, which was drained in the 13th century, with wedge-shaped fields separated by drainage ditches that spill into the central circular depression. 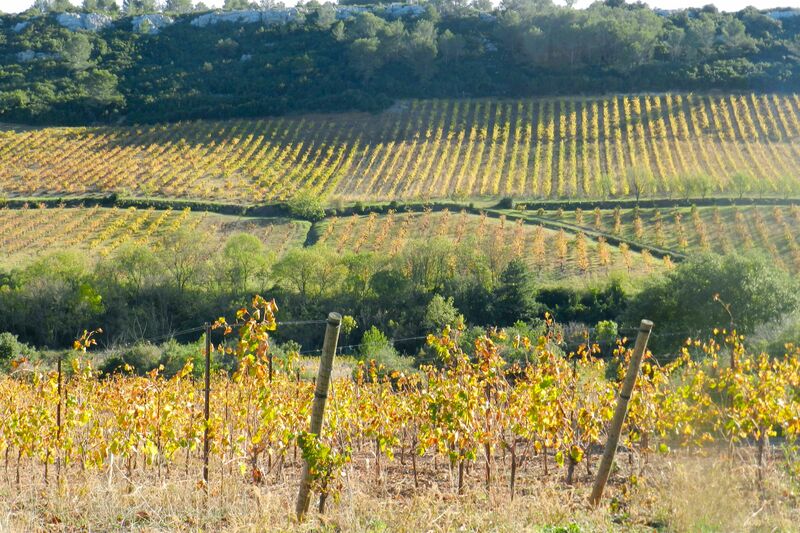 Situated between the coast and the foothills of the Cévennes and the Larzac, the area boasts some of the oldest vineyards in the world, with a remarkable diversity of soil types and micro-climates. Like Provence, the area enjoys 300 days of sunshine per year, but the food, cheeses, and wines are much heartier. Olive groves that were pulled up early in the century to produce cheap wine are being replanted everywhere. La Lucques, an old local variety of olive, has hints of avocado and hazelnut. Our second week, we stayed in a tiny hamlet near Bize-Minervois, at La Bastide Cabezac, part of the Château of the same name. We dined in the restaurant one evening, on huge steaks of wild red deer from the Pyrenees. We washed it down with the winery’s Cuvée Arthur blend of Syrah, Mourvèdre, and Grenache. But the meal, at 8 pm, was too much, too late for us, and we returned to our routine of eating our big meal in the middle of the day. Just a short walk down the road, on the other side of the river Cesse, we found ourselves several times drinking rosé or coffee with the locals in the local bar/bistro/gas station. 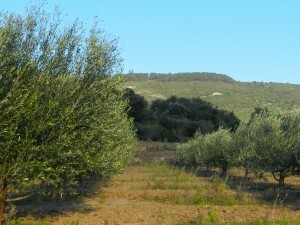 Just behind the pub, the local olive oil cooperative, L’Oulibo, is located. Most of the locals drinking in the pub worked there, where the local Lucques, Picholines, and Ascolana olives are pressed for oil and cured for the table. I served as a spokesperson for the International Olive Oil Council for 10 years and I cannot remember ever having an olive I loved as much as the Lucques, except perhaps my beloved Taggiasca of Liguria. 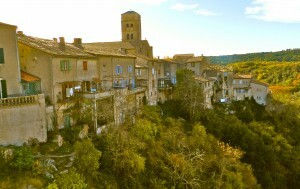 The Minervois is stunning; the city of Minerve itself, gorgeous. Roquebrun, said to be one of the prettiest villages in France, nestles up to the Orb in the foothills of the Black Mountains in the Hérault, northeast of Saint Chinian. We meandered in our rental car throughout the region, going from the river valleys along the Canal, through miles and miles of plane-tree-lined roads surrounded by vineyards, up to verdant hills and breaktaking cliffs along mountain switchbacks. We often planned our day trips around the market days in the villages we wanted to visit. In addition to the North African foods and confits and cassoulets and sausages and cheeses, we saw fresh wild mushrooms, the first of the citrus, and myriad greens. We often had a salad for supper. 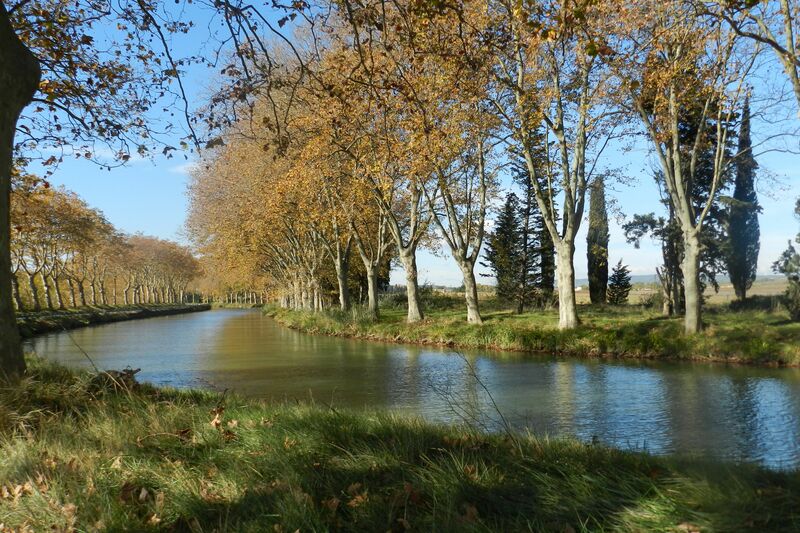 We were particularly charmed by “Le Grand Bief,” a 30-mile stretch of the Canal with no locks. Everywhere were the plane trees and the dazzling blues and yellows of the Occitane sun. “Le Grand Bief” is a 30-mile stretch of the Canal du Midi with no locks. Our third week we spent in Carcassonne, both exploring the medieval city and the Canal, as we gorged on cassoulet and the lush local wines.